McDonagh & Shattenkirk - Partners, But More Importantly Friends!! This is an update on my post from a few days ago, here. In that post, I noted how FotB @NaturalStatTrick has added a new “WOWY” tool, and a quick look at the McDonagh/Shattenkirk pairing suggested they be given more time together. Yesterday, another FotB, Micah Blake McCurdy (@IneffectiveMath) released a new WOWY visualization tool at HockeyViz.com that allows you to visualize 5v5 Unblocked Shots for groups of teammates. This tool will be available to subscribers only in a few days, so gorge away while you can (or more importantly support HockeyViz through the link at the bottom). I wanted to take a deeper look at the McDonagh/Shattenkirk pairing using these two tools, and some other stats. First, I've updated the shots/goals results from NaturalStatTrick for 4 pairings: McDonagh with Shattenkirk, and then McDonagh with the other likely NYR right-side partners: Brendan Smith and Nick Holden. I also looked at Marc Staal, since he's played a fair amount of time with McDonagh (47 minutes), though I assume most of that is with McDonagh on the right side, which confuses things a little. Stephen Kampfer is a right-side option, but he and McDonagh have only 5 minutes together, which, knowing Stephen Kampfer, is probably one shift, so I ignored it. Later, we'll look at where the NYR are getting unblocked shots for, and giving up unblocked shots against, with those 4 pairings. There's a lot of data here, but starting at the top with Corsi (the larger sample of shots) and working down to High Danger Chances (the smallest sample of shots) we have each of the 4 pairs, their results and where those results rank compared to the other 3 pairs. So, for example, McDonagh/Shattenkirk have 71.90 CF/60, which is the best. Similarly, Staal/McDonagh have 25.05 HDCF/60, ranking them first. You get it. If you look mainly at the highlighted "1" rankings - you basically see either McDonagh/Shattenkirk or Staal/McDonagh. Note, however, that the McDonagh/Shattenkirk "1" rankings are in the broader-sample metrics of Corsi (both for and against), whereas the Staal/McDonagh "1" rankings are mostly in smaller-sample metrics like Scoring Chances and High Danger Chances. That could suggest that the McDonagh/Shattenkirk results are more talent-based, reliable, and predictable fo future results. Still, we're talking verrry small samples and that makes my previous sentence probably wrong. In any case, I would say these results suggest that these have been the two best McDonagh pairings. The other thing that stands out - heckuva lot of "4" on the McDonagh/Smith pairing, and some fugly results. That pairing was rough. Now we know what type of shot results these pairs have had. Thanks to HockeyViz's new WOWY visualization tool, we can see where some of these shots are coming from. Remember - these are showing Unblocked Shots (Fenwick) only. Another note – MSG has a reputation for being bad at accurately recording shot locations. This was written up extensively by Michael Shuckers and Brian Macdonald in 2014 (link to PDF paper here). FotB Cole Anderson (@CrowdScoutSprts) says MSG regularly codes shots as being closer than they might be. However, HockeyViz does not adjust shot locations for its data. If the MSG “recorder bias” is true, then it means that “Unblocked Shots For” locations may look better (closer to the net) than reality, and “Unblocked Shots Against” locations may look worse (closer to the net) than reality. Red in these charts means "more", and blue means "less". So red is good for the "shots for" and bad for the "shots against". On the left, the NYR with the McDonagh/Shattenkirk pairing had more Unblocked Shots than league average near McDonagh's point, on top of the crease, and near the right wing circle. On the right, the NYR with this pairing gave up more Unblocked Shots than league average in the high slot, and on the right side in general - which is Shattenkirk's side. Not particularly promising on the defensive side. For these looks at the comparison to team average results, green is more, and purple is less. These show similar patterns to the previous league comparison ones, so that we see more Unblocked Shots For from the right circle and left point. Similarly, on the Unblocked Shots Against picture, there's too much green in the high slot (though this time slightly learning toward McDonagh's side), and more green at the point on Shattenkirk's side of the ice. Looking at McDonagh’s results with Brendan Smith, compared to the league average first. 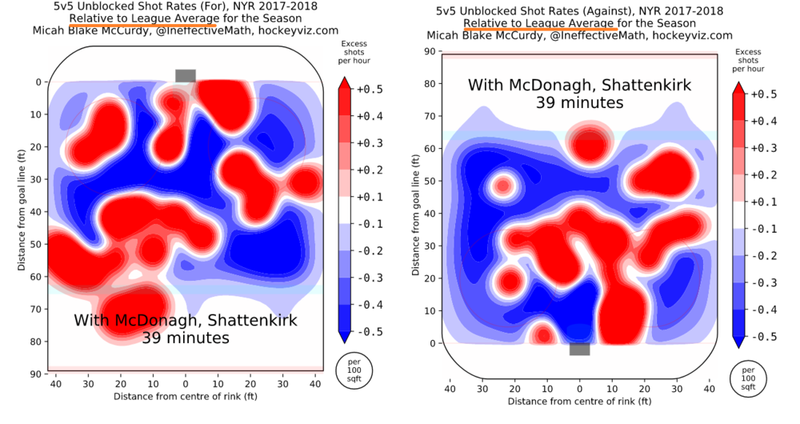 McDonagh/Smith (67 minutes) have almost double the 5v5 minutes as McDonagh/Shattenkirk (39 minutes), and their results are demonstrably worse than the McDonagh/Shattenkirk pairing on the defensive side. In the picture on the right, there is a loooot of red - the entire crease/high slot area is basically Bloodbath and Beyond. The picture on the left shows better than league average Unblocked Shots For from the crease (which could explain some of the pairing's 20% shooting percentage). Similar results for McDonagh/Smith compared to the NYR team average only – with more white. White, in these charts, means that the results are basically at the league or team average, as applicable. Again, in these limited minutes, the McDonagh/Smith pairing has been particulary weak compared to the NYR at keeping Unblocked Shots Against from the slot down. Now we look at the current holder of the “McDonagh’s Partner” seat, Nick Holden. McDonagh/Holden are already up to 60 minutes, which is again almost double what McDonagh/Shattenkirk have had. The Unblocked Shots For visual compared to the league average looks good – a lot of positive (red) results in the slot, the high slot, and the LW side as a whole. The Unblocked Shots Against chart compared to the league average, however, is more scattered. The slot is again an isuse, but the red spots are more localized than in either the McDonagh/Shattenkirk or McDonagh/Smith views. Again, we see similar patterns when looking at McDonagh/Holden as compared to the NYR team only – a lot of deep green on the left wing side, and a key splotch of green right in front of the goalie. The team-focused Unblocked Shots Against are similar to the league-focused ones - but with a really good, deep purple zone to goalie's right. Might be some truth to the rumor I am just starting that Holden always wants to play "Smoke on the Water" in the dressing room before the game. Surprisingly to me, the Staal/McDonagh pairing might have the best visual results of these groups. Remember earlier how I questioned this pairing's good results for Scoring Chances and High Danger Scoring Chances? These pics support those results. On the left, showing their Unblocked Shots For compared to the league average, we see a lot of red right in crease/high slot. In the pic on the right, showing their Unblocked Shots Against compared to the league average, we see the pairing doing a pretty good job of keeping shots from close to the net and the slot (with the most concentrated red at the point on the right side (which again I am assuming is McDonagh's side). The Staal/McDonagh pairing results compared to their teammates are similar. A nice spread of green in the high slot (maybe the team could do a little better to get right on top of the crease). And the defensive zone is even better - almost all purple from the goal-line to the top of the circles, with the only blemish in the faceoff circle on Staal's side. So what difference does it make? 1. The McDonagh/Shattenkirk pairing was not that bad (except in limiting shots from near Shattenkirk's wing), and in some cases, was really good, on both the offensive and defensive side. At the very least, the NYR should consider giving McDonagh/Shattenkirk more time as a pairing. 2. The McDonagh/Smith pairing was a disaster. Banish it from our collective memory. 3. The McDonagh/Holden pairing, and the Staal/McDonagh pairing, haven't been as bad as I expected, and certainly not so bad that the NYR couldn't consider playing them more. Staal/McDonagh had some questionably great results in scoring-chance based metrics (and actual goals), but the location of team shots for and against while this pair was on the ice is promising. ...Again, I’m right in my analysis. PS – Support NaturalStatTrick here. Support HockeyViz.com here.